We are giving away $100 to Sephora!!! 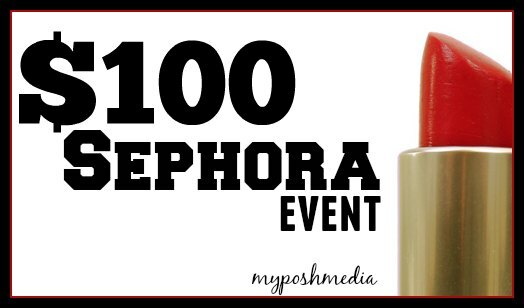 One winner will win $100 to Spend at Sephora. I am so excited to bring this giveaway to all of you. I know that spending any money on myself is difficult, it always seems to go to the kids and house. This would be the perfect excuse to try that new lipstick or nail polish. What would you buy if you won this? Disclosure/Disclaimer: This site or any other site associated with this event has in no way been compensated for the preceding information. This giveaway is valid where allowed by law, open to anyone who is able to shop at this site mentioned in the giveaway and who is over 18 years of age. One winner will be randomly selected on 3/30/15, notified via email, and will have until 4/01/15 to reply. If there is no reply another winner will be randomly selected. Please use your real email address if you are serious about winning this. Winners are posted on the MyPoshMedia site and, not on the entry widget itself, unless the winner wishes otherwise. Thanks so much! Previous post: Febreze Roadtrip to Freshness Gift Card Giveaway!